Home > Recent > How Does Salmonella Get Into the Food Supply? It seems like every day there’s a new story in which manufacturers are compelled to recall their products in light of food-based salmonella fears. These products range from peanut butter to leafy greens to raw chicken and dairy. What’s more, over the Christmas period, we’re consistently reminded to thoroughly cook all the poultry, sausages, bacon and raw meats we’ll undoubtedly be guzzling (even though we promised not to). Just recently, we saw major shopping chain Aldi in the news for its supplier, Dollar Tree, running a recall of its macaroni and cheese pots over contamination concerns. But why is all our food apparently so dangerous? Indeed, why is salmonella such a common threat? How does it get into our food, and how can we prevent this from happening, to promote better food safety and reduce our chances of illness? Salmonella, in essence, comes from animal faeces. Specifically, it’s a type of bacteria that circulates around various hosts, and thrives when it makes its way into the intestines of cattle, birds, mice, chickens and, yes, infected humans. Tracking the specific origin of the bug isn’t necessarily relevant; it’s a microbe which has evolved just like any other organism over a long period of time. However, for all intents and purposes, let’s just say that if you get salmonella poisoning, it’s most likely because your food has come into contact with poop. Seeing as how there are a myriad of ways in which this could occur, pretty much any food stuff can carry salmonella. Cross-contamination is the fundamental root of the issue. Indeed, you’re right. The raw meat of an animal is far more likely to give you salmonella poisoning than a HobNob. Why? Well, for one, the biscuit had to be cooked when it was made; meaning the potentially dangerous ingredients which could bear salmonella (milk, eggs) had enough time in the oven to kill the trace pathogens. However, perhaps more importantly, the meat itself is likely to have come into contact with animal faeces, seeing as how it was actually a piece of an animal – an animal, indeed, which most likely wallowed in communal poop during its lifetime (for lack of a better expression). Poop-wallowing means two things: increased risk of illness for the animal itself; and increased risk that the meat itself will come into contact with faecal matter and absorb it. Such manners of living aren’t necessarily those of the animal’s choosing, but are generally necessitated by unsanitary conditions at farming facilities. 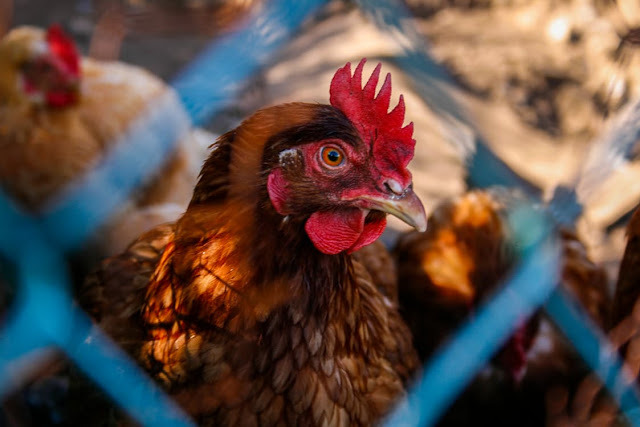 Battery farming, we know, certainly does increase the risks of salmonella poisoning in chicken products (although backyard chickens can also develop it). The stress under which chickens are placed lowers their immune defences and makes them more susceptible to developing the illness; and the generally unsanitary conditions in which they are forced to live exacerbates things further. Once the bug is in the animal’s body, it’s present in the meat which that animal provides. Indeed, after slaughter, chicken meat itself is particularly susceptible to cross-contamination with salmonella, as it tends to be more porous than other, tougher meats like beef. Chickens have much thinner skin than cows and other cattle; the thick, leathery hides of which act as a barrier between external contaminants and their bodies. If slaughterhouses are unsanitary, poultry can become infected more easily; and we tend to eat chicken products which still have the skin (unlike the meat of other animals). However, the story isn’t confined to meat products. More sterile foods are also vulnerable to picking up salmonella during the production process. Leaving aside the more obvious ways in which this can occur, such as cross-contamination via knives and chopping boards (which can be avoided by colour coding equipment), we’ve also seen cases of water leaks around industrial machinery necessitating recalls. Recently we saw the FDA confiscate 1.8 million kg of milk powder from Valley Milk Products LLC, thanks to a failed health inspection wherein condensation was found to be dripping from the ceiling into machinery. The risk, it seems, was that the water itself could have come into contact with anything – including faecal matter – which could then make its way into the food. Generally, then, poor sanitation is the root of salmonella outbreaks. Consumers can help avoid getting sick by cooking food thoroughly and keeping their equipment clean; but ultimately the majority of risk lies in the hands of manufacturers. There’s no realistic way to eradicate salmonella from the food supply; but less reliance upon battery farming, cleaner manufacturing facilities and strong government health inspections will help to ensure the risk is lowered significantly.